Land Rover is a car brand that specialises in four-wheel-drive vehicles, owned by British multinational car manufacturer Jaguar Land Rover, which is in turn owned by India’s Tata Motors since 2008. The Land Rover name was originally used by the Rover Company for the Land Rover Series, launched in 1948. It developed into a brand encompassing a range of four-wheel-drive models, including the Defender, Discovery, Freelander, Range Rover, Range Rover Sport and Range Rover Evoque. Land Rovers are currently assembled in the company’s Halewood and Solihull plants, with research and development taking place at the Gaydon and Whitley engineering centres. Land Rover sold 194,000 vehicles worldwide in 2009.Land Rovers (the Series/Defender models) are available in a variety of body styles, from a simple canvas-topped pick-up truck to a twelve-seat fully trimmed station wagon. Both Land Rover and out-of-house contractors have offered conversions and adaptations to the basic vehicle, such as fire engines, excavators, ‘cherry picker’ hydraulic platforms, ambulances, snowploughs, and six-wheel-drive versions, as well as one-off special builds including amphibious Land Rovers and vehicles fitted with tracks instead of wheels. In September 2013 Jaguar Land Rover announced plans to open a 100 million GBP (160 million USD) research and development centre in the University of Warwick, Coventry to create a next generation of vehicle technologies. Power take-off (PTO) was integral to the Land Rover concept from 1948, enabling farm machinery and many other items to be run with the vehicle stationary. The PTO gearbox casing is bolted to the rear chassis cross-member and an 8 by 8 inches (200 mm × 200 mm) belt pulley driven from the PTO shaft through two bevel gears can be bolted to the PTO gearbox casing. PTOs remained regular options on Series I, II and III Land Rovers up to the demise of the Series Land Rover in 1985. An agricultural PTO on a Defender is possible as a special order. Various Land Rover models have been used in a military capacity, most notably by the British Army and Australian Army. Modifications may include military “blackout” lights, heavy-duty suspension, uprated brakes, 24 volt electrics, convoy lights, electronic suppression of the ignition system, blackout curtains and mounts for special equipment and small arms. Dedicated military models have been produced such as the 101 Forward Control and the air-portable 1/2-ton Lightweight. Military uses include light utility vehicle, communications platform, weapon platform for recoilless rifles, Anti-tank (e.g. TOW or M40 recoilless rifle) / Surface-to-Air Guided Weapons or machine guns, ambulances and workshops. At MKL we aim to provide quality Land Rover Engines using engine reconditioning procedures. Our reconditioned Land Rover Engines are aimed to be restored closer to their original factory specifications. Because new engines are typically so expensive, reconditioned engines are considered the next best thing as they are aimed to be offered with quality and cost effectiveness in mind. As a result, reconditioned Land Rover Engines will typically be offered with a lengthy warranty. Nationwide delivery services are also available. This entry was posted in Uncategorized on March 30, 2016 by Debdip Roy. Pininfarina S.p.A.—an independent Italian car design firm and coachbuilder in Cambiano (Italy)—has revealed a powerful and beautiful cherry red concept Zetor Tractor. The company—that has history to design some of Ferrari’s best-looking vehicles—launched the tractor at Agritechnica Fair in Hannover, Germany. The product is a joint endeavor of the Italian design firm and a Czach tractor manufacturer. 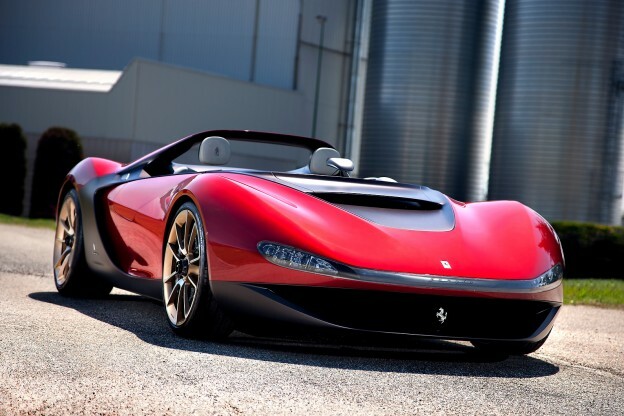 It is Pininfarina’s vision to develop a farm vehicle with having sleekness and look of a sports car. Traditional tractors like the all-American John Deere tractors have the form follow the function. This endeavor from Italian manufacturer has been designed with a sloping bonnet and sinewy creases in the fenders. As far as design is concerned, the two-tone paint is significant between functional areas—the dark area highlights, the technical element|s—and the rest part is finished in red. The sloped side panels cover significant mechanical components that represent competitive motoring. Pininfarina said, “The concept is a preview for the new Zetor flagship, adding that it will take care of the full range of the tractor maker in the future”. Pininfarina S.p.A., expanded as Carozzeria Pininfarina, is primarily an independent Italian car design firm and coachbuilder in Cambiano, Italy. Founded by Battista “Pinin” Farina in 1930, the company designs, assembles, manufacturers, and tests prototypes under contract for other automakers. This entry was posted in News and tagged Agritechnica Fair, Carozzeria Pininfarina, Ferrari’s on December 8, 2015 by admin. is one that has been stripped down, examined and then comprehensively refurbished with brand new components. The aim of this procedure is to essentially provide our clients with a ‘like new’ engine. But due to the nature of the Land Rover vehicles, many of their models have powerful engines with large displacements which makes the reconditioning process a lot more sophisticated. Over the years we have a developed a great deal of experience in the field of engine reconditioning and with a highly skilled team of engineers at our disposal we’ve become extremely adept at rebuilding Land Rover engines. This entry was posted in Uncategorized on October 16, 2015 by Debdip Roy.